See Teddy in a Bag at the Stacey Community Centre Christmas Fayre this Saturday. Teddy in a Bag will be there with lots of different bags, baskets and moses baskets with teddies inside and with other Christmas gifts too, from small stocking fillers and teddies for the Christmas tree, to larger bags for all ages! And Little Gifts of Southsea will be there with beautiful Christmas decorations, gorgeous jewellery and lots of small, unique gifts for all ages. Christmas fun for all ages and lots of Christmas stalls too. Join everyone for Christmas fun and mince pies this Saturday! And please do come along and visit our stalls! 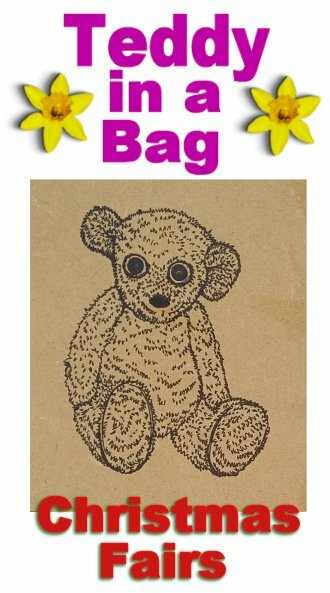 Posted on November 29, 2018 by Silvi VealePosted in Christmas Fairs, Teddy in a bagTagged all ages, Children's bags, Christmas Fayres, Crochet Bags, Gift Sacks, moses basket, stocking fillers, tiny baskets. Please come along to the Love Baffins Christmas Market this coming Saturday, 24th November. The Christmas Market will be held in Tangiers Road, Portsmouth, with stalls and events outside, along Tangiers Road, and inside and in the grounds of the City Life Church. Love Baffins is one of the great Portsmouth markets of the Christmas season, with lots of stalls, great local bands and performers, and many great things to entertain the children too, including Father Christmas of course! Teddy in a Bag and Little Gifts of Southsea will be there, with our stalls filled with handmade gifts for all ages. Jewellery, Christmas Decorations, Keyrings, Small gifts, children’s gifts, and of course, Teddies in bags from micro to medium sized! We will be in the City Life Church, with lots of other stallholders, plus Christmas games, raffles and more. So do come along to the Love Baffins Christmas Market if you can. Posted on November 21, 2018 November 18, 2018 by Silvi VealePosted in Christmas Fairs, Teddy in a bagTagged Children's bags, Christmas Fayres, micro teddies.